BEST PUMPKIN BISCUITS-The Southern Lady Cooks, these are so easy and always a hit at my house. These are the best pumpkin biscuits! They are easy to make and always a hit at my house. If you like pumpkin, you will love these biscuits. They are light and fluffy and wonderful with butter and honey or molasses. Mix flour, sugar, ginger, cinnamon, allspice and nutmeg together in a large bowl with a wire whisk. Cut in the shortening until mixture is like coarse crumbs. Add buttermilk and pumpkin and mix with spoon. Turn onto a floured surface. I just pat these out with my hands and cut out. (I used a juice glass because I wanted a smaller biscuit for these). Bake in preheated 450 degree oven for 12 to 15 minutes. This made about 20 biscuits using a smaller cutter. Enjoy! These pumpkin biscuits are easy and always a hit! Mix flour, sugar, ginger, cinnamon, allspice and nutmeg together in a large bowl with a wire whisk. Cut in the shortening until mixture is like coarse crumbs. Add buttermilk and pumpkin and mix with spoon. Turn onto a floured surface. I just pat these out with my hands and cut out. I used a juice glass because I wanted a smaller biscuit for these. Bake in preheated 450 degree oven for 12 to 15 minutes. This made about 20 biscuits using a smaller cutter. We love to serve these with butter, honey or molasses. Don’t Forget to Pin our Pumpkin Biscuits! © 2013 The Southern Lady Cooks photos and text – All rights reserved. No copying, posting on other sites, or other uses allowed without written permission of the copyright holder. I don’t have any pumpkin handy, but I do have a can of sweet potatoes which I’ve had for quite a while since I found out I’m the only one who likes them! 🙂 Do you think I could puree the sweet taters and substitute for the pumpkin? I’m thinking I might need to add some or all of the juice since the texture is drier than pumpkin. Thank you for all of the yumderful recipes!! You have “the gift”! what could be substituted for the shortening in the biscuits? When I make a cake I use applesauce. Could I use applesauce in the pumpkin biscuit recipe instead of shortening? Yes, I think you could Shellina. The picture makes me want to grab one!! They look so delicious I can almost smell them . Going to make these this weekend! Thank you for the recipe. Do you have a good recipe for Buttermilk Biscuits? Just made pumpkin muffins yesterday, they are good, now will try these, but I’m going to try using Bisquik since i’m kind of disabled. Pumpkin is not only good, it is very good for you! I’m always looking for new uses for it! I’m looking forward to making these biscuits soon! Loved these! They were sooooo tender too. 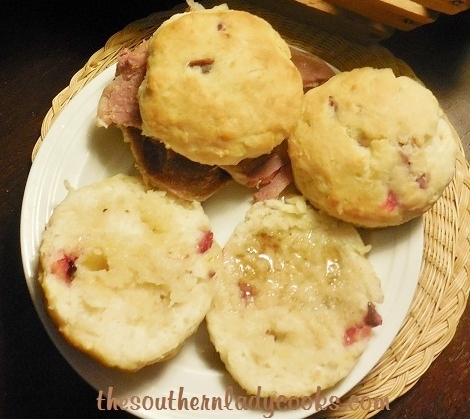 We put country ham in ours…..Mmmmmmmm, mmmmmmm! Thank you! What leavening agents and measurements if using All-purpose flour in this recipe? They were pretty sticky so I had to add extra flour when on the board & “turned” it into dough until not sticky & then patted flat enough then cut out. They turned out nice. I didn’t have any buttermilk or milk so used almond milk – still fine! I hope all the bad weather missed you. Hi Helen, It is good to hear from you. I hope you are doing well and enjoying your new place. Yes, we had wind and rain and that is about all where I am. The holidays will be here before we know it. I remember how much you enjoyed Christmas. You are probably all ready for it by now. Love and hugs. I found these very sticky. I added more flour but after adding quite a bit I knew this just wasn’t going to pat out, cut and lift without falling apart. The only thing I changed in the recipe was to make buttermilk with white vinegar. Could this have been the reason? I don’t think that would have made a difference.This is a wet dough in the beginning but if you added more flour it should get where you could pat it out with your hands. I don’t try to roll it out because of that. I always find baking bread of some sort intimidating so I love that I think that this is simple enough that even I can attempt to make these lovely biscuits! Thank you so much for sharing! Pinning this! Your biscuits are the best. Looks wonderful. Will have to try these. THANK YOU, JUDY……………THESE SOUND HEAVENLY!! Peel your potatoes. Slice them & layer them in a skillet, with butter & either white or brown sugar (which ever you like best) and simmer on stove until tender. You will not need any water. This is what I call candied, not a casserole. This is how I make the candied sweet potatoes, too and they are wonderful.